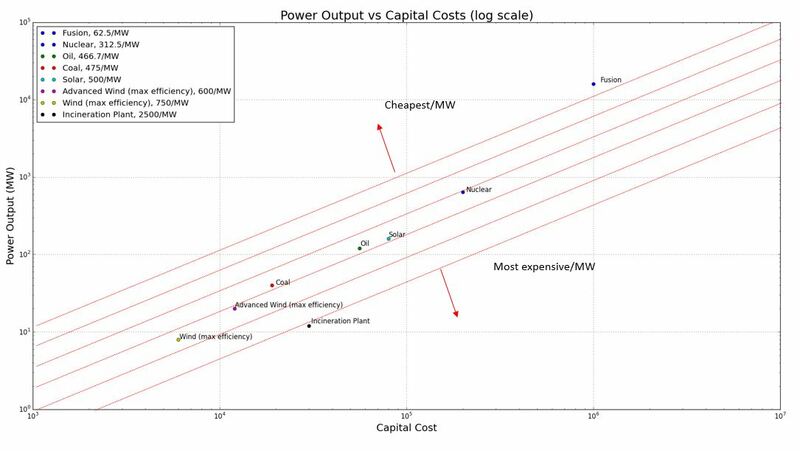 In terms of capital (construction costs) per MW energy, Fusion comes in cheapest by a long way, followed by nuclear, oil, coal, solar, wind and the incineration plant. Hydro not included as it depends upon the size of the dam. Over the long term upkeep costs will ideally be minimised. 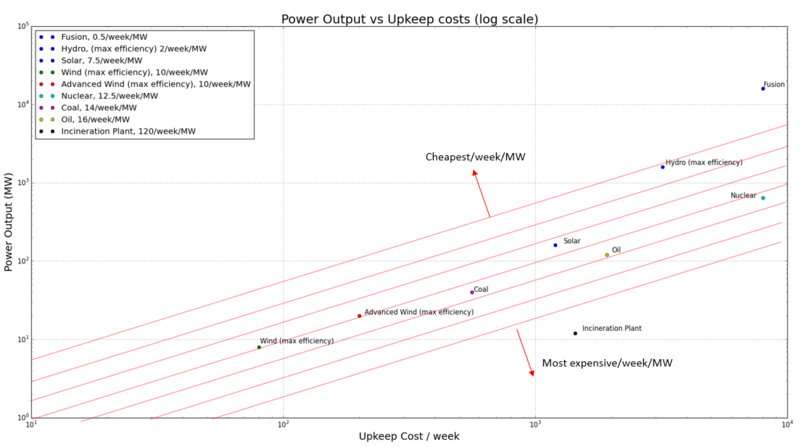 Fusion is once again the cheapest in terms of upkeep costs/week/MW. Hydro with it’s maximum possible efficiency of 1600MW comes in 2nd however this maximum efficiency will rarely be reached in practise. Since the upkeep costs of Hydro are fixed, in order to out perform solar power a Hydro Plant must produce at least 427 MW electricity. The total cost per MW to maintain a power source over time is give by Cost= (Construction costs + Upkeep*time)/(Power Output). 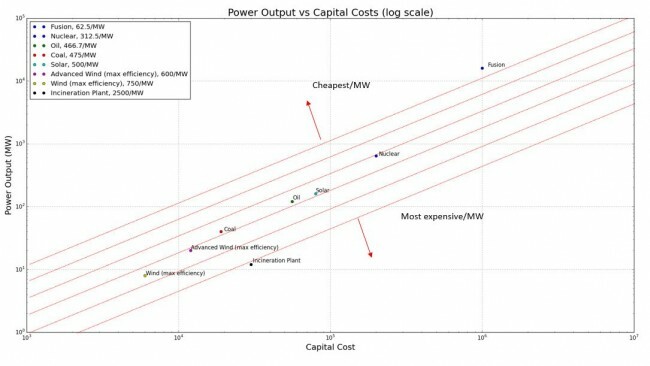 Over a long period of time the capital costs become irrelevant and the cheapest power source becomes those with the lowest cost/week/MW. However this does not mean sources like coal should be completely disregarded. In the early game available spending money is arguably more important than income and it will take a full 69 weeks before wind becomes a cheaper investment than coal. 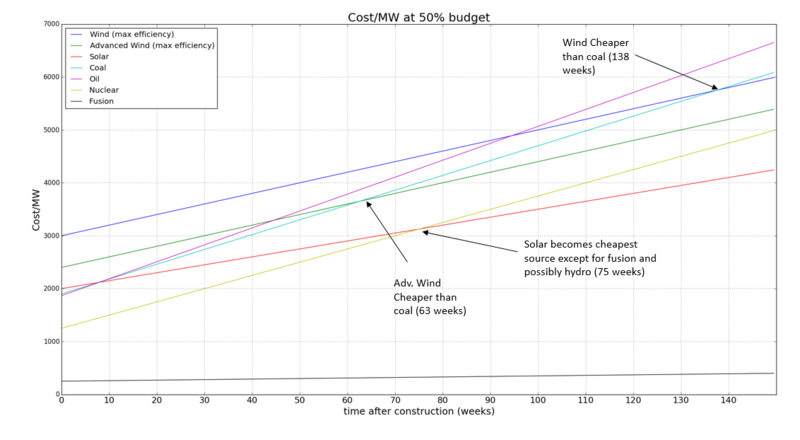 If you can afford to spend 1/3 of your starting budget on power then coal will be a better early game investment than wind. Nuclear looks to be the most efficient medium term investment for a mid game power source. Unfortunately by the time it’s unlocked your city is unlikely to have any major financial problems and there is no reason not to go for the cheapest candidates (solar or hydro). 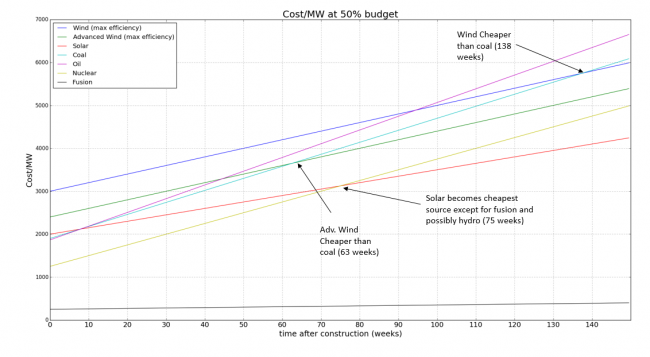 Does changing your budget affect which power sources to build? As it turns out yes. Capital costs will be unaffected but upkeep and power production will change. This can make increasing the budget a feasible choice over purchasing a new plant outright if you are tight for money. 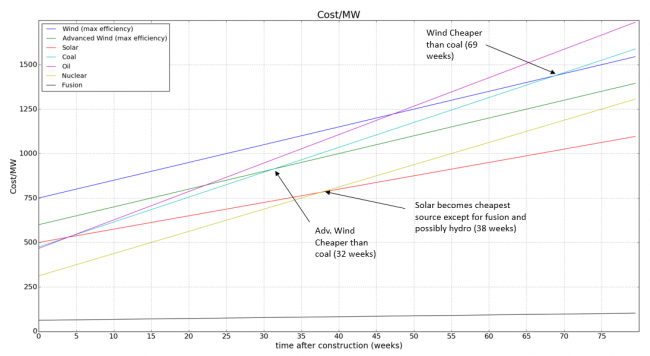 Interestingly this scales the speed at which lower upkeep sources outpace lower construction cost sources, so if your planning on using this strategy it might be worthwhile to build those windmills after all! While it’s never optimal to run a city on a low power budget, if you have built a new plant and are producing an abundance of power there is no reason not to turn it down and save some money. Decreasing the budget also makes it more worthwhile to keep your low construction cost sources for longer. It now takes a full 138 weeks for wind to become less expensive than coal. * Oil plants are expensive to upkeep and I can’t think of any good reason to build one. 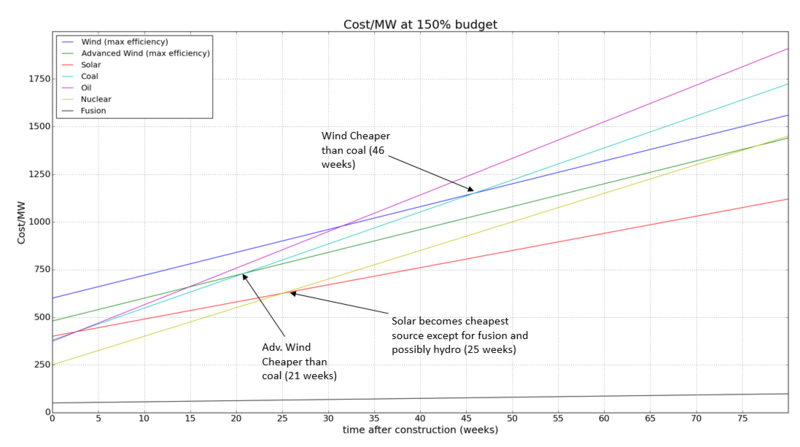 * Going coal over wind in the starting game will save you some extra construction money, but don’t forget to replace them with solar/hydro/advanced wind when you can afford to. * Fusion is the undisputed best power source but isn’t available until late game.